"He was the best player on the ice for us by a country mile," Lightning coach Jon Cooper said. "That was a pretty good test for us," Vasilevskiy said. "Guys scored important goals at the end of the second." "We did everything but put the puck in the back of the net," Toronto center John Tavares said. "I don't think you want to hang your head. I think you're obviously disappointed in the result. We have high expectations for ourselves. It's a long season. We'll see these guys again." 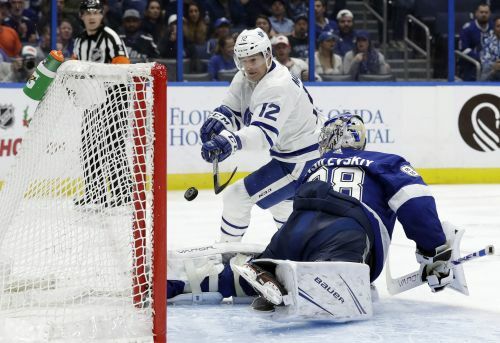 The Maple Leafs hit the crossbar or post three times in the first and Vasilevskiy made a left pad save on Tavares' in-close backhand late in the period. "He played unbelievable," Maple Leafs center Auston Matthews said. "I thought we played well. We had a ton of chances. I think sometimes you've just got to tip your hat and move forward." NOTES: Mitchell Marner (seven), Tavares (six) and Kadri (six) combined for 19 shots. ... Toronto (15-1-1) lost for the first time in regulation when scoring first. ... Marleau played in his 738th consecutive regular-season game and passed Jay Bouwmeester for the seventh-longest streak in NHL history. ... Toronto LW Zach Hyman served the second of a two-game suspension for a hit on Boston D Charlie McAvoy on Saturday. ... Tampa Bay RW Mathieu Joseph sat out with a lower-body injury.